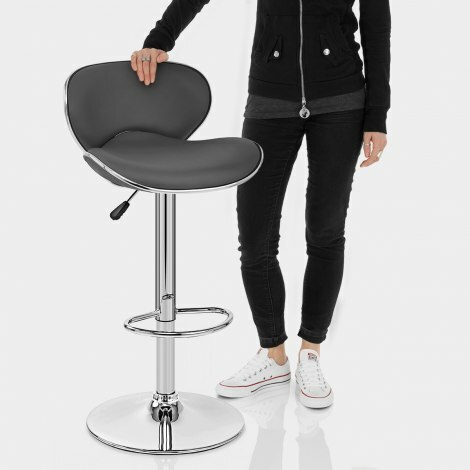 Marvellously minimalist, the Duo Bar Stool Grey is a sleek design that will make an impressive impact on your bar area. A glam piece of furniture from all angles, the Duo is set to shine in your interior and will continue to make a statement for years to come. Densely padded for supreme comfort, the grey faux leather seat and corresponding backrest are also contoured to the body, providing support. Both the seat and backrest also feature a chrome strip that runs around the outer edges for cool and crisp finish, whilst the backrest also extends slightly past the seat pad for a more distinguished look from all angles. 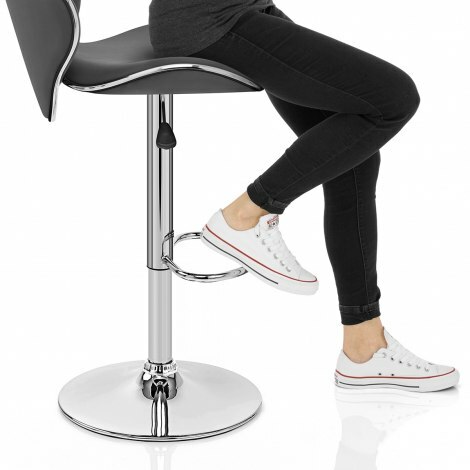 Composed of contemporary, polished chrome the stem includes a stabilising footrest, and houses a gas lift mechanism that allows height adjustment and the ability to rotate a full 360 degrees when seated. A circular base finalises the modern look, and includes a practical, protective ring to help look after floor surfaces. "Beautiful stools, delighted with them, very comfy"
Good chairs. Delivery was on time. Absolutely love this stool, terrific value for money. I’m a makeup artist it’s perfect for my clients. Speedy delivery too. Love these stool well made, very comfortable. Great fast delivery service too. Excellent service, arrived on time, easy to build & video link was fab. Comfy and stylish!! !